In the course of using an oscilloscope, there are likely to be times when you'd like to separate pulses based on wave shape or some parametric value and average only those pulses that meet some criteria. 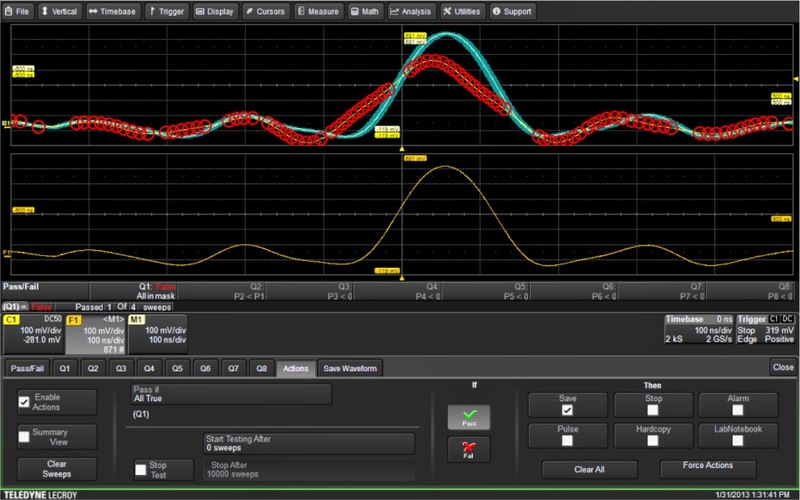 Teledyne LeCroy's oscilloscopes, and others, provide pass/fail testing using masks and/or parametric readings to qualify waveforms before they're added into an average or other processing function. Let's take a look at how this works on a Teledyne LeCroy oscilloscope. Consider the example shown in Figure 1: To set up a selective average based on wave shape, one must create a tolerance mask using the Pass/Fail setup dialog box for condition Q1. In Figure 1, we see waveform C1 being tested against such a mask. If all points of the trace are inside the mask, the waveform is saved to memory M1. The oscilloscope's averager uses M1 as its source and accumulates only those pulses that match the tolerance mask. added to the average input. The lower grid of Figure 1 shows trace F1, a math function defined as the average of M1. Again, only waveforms that match the shape of the mask are added into this average. Waveforms that do not match the mask (represented by the red circles showing mask violations) are not saved to M1. Note that the Pass/Fail action selected is to save the waveform if it passes (defined as having all points inside the mask). The save action must be set up in advance using the Save Waveform selection in the oscilloscope's pulldown File menu. This principle can be taken a bit further by averaging only pulses that meet the mask criteria as well as satisfying specific parameter limits. Pass/Fail testing supports up to eight criteria with a variety of logical combinations to initiate actions. Figure 2 shows an example of a similar selective-averaging setup. In this case, only pulses with a width of less than 4.65 μs are accumulated in the average. In the Channel 1 trace of Figure 2, display persistence has been turned on so that the full range of pulse widths are displayed. Yet, note that only the pulses that meet the width criteria of less than 4.65 μs affect the average. 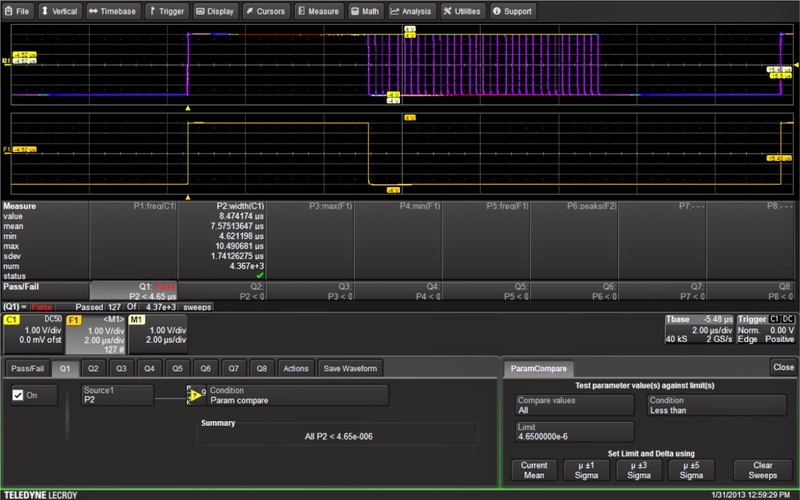 Hopefully, these examples give you an idea of the flexibility that selective averaging provides in an oscilloscope.